If your search for the best data cabling in North Lauderdale brought you here, congratulations! You have come to the right place. Florida Data Cabling has been providing South Florida businesses with expert network cabling services. We are so good at what we do because we understand how important having a complex yet reliable and secure network service is for the success of your business. You did not get into business to simply be average. You got into business because you wanted your business to succeed and thrive. The only way to accomplish that with today’s technologically driven, competitive market is to have a structured cabling and network wiring system that keeps pace with the fast moving speed of technology. Florida Data Cabling can help you accomplish this goal in the same way that we have helped many South Florida businesses. Our clients include businesses in Fort Lauderdale, West Palm Beach, Miami, and other South Florida cities. Our data cabling technicians have installed as well as designed a number of data cabling projects. We have worked with large corporations and small firms in North Lauderdale and the surrounding area. Our customers know us for having an amazing track record when it comes to designing and installing structured cabling solutions that are scalable, secure, and efficient. As voice and data specialists, we work with Cat3, Cat5e, and Cat6 data cabling. There is no project that is too large nor any project too small for our technicians to tackle. It does not matter if you need network cabling, data cabling, phone cabling, data wiring, or phone wiring, we will do the job well and guarantee that you will be satisfied with the results we produce. Our team is experienced in managing complicated projects in data centers, universities and schools, call centers, and industrial and manufacturing locations. We can supply, install, and terminate any type of network cabling. We have worked with a number of the IT companies here in South Florida, providing network wiring solutions. What if your cabling needs repairs? We can help you. If you have a cabling emergency, we should be the first one who you call. We understand how frustrating it can be for you when your data cabling, data wiring, phone cabling, or phone wiring is not working the way that it should. Your business slows down, productivity grinds to a halt, and your bottom line is affected. Let the experts at Florida Data Cabling get your business moving again. Our technicians will effectively take care of the job so that you don’t have to worry about it. Focus on running your business, and we will make sure that your structured cabling works the way it should. We deliver our services on time. We complete our projects on budget. We minimize disruptions to your daily operations. 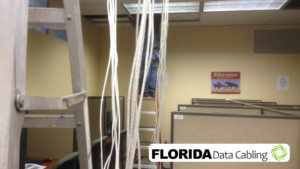 This is why Florida Data Cabling is a trusted by South Florida companies to address their cabling needs.